How Do You Define Critical Thinking? What does critical thinking look like? Educators widely agree that critical thinking skills are key to student learning and achievement. However, when it comes to actually defining those skills and systematically teaching them, it’s not always straightforward. For the last 16 years, Mentoring Minds has worked to integrate critical thinking into instruction with every resource that we’ve published. We’ve wanted to make the teaching of critical thinking straightforward, so we’ve embedded opportunities for deeper thinking throughout our standards-aligned student resources and provided teachers with instructional strategies that promote student thinking and questioning. Each and every resource we’ve published has been based in research, filled with classroom-tested strategies, and developed by former educators. Critical thinking is more than activities and strategies, though. It’s about creating a school culture that supports all students in becoming active, hands-on learners—learners who ask questions, collaborate with their classmates, strive to master concepts, and reflect on ideas they encounter. In order to create a culture of thinking, schools need to be able to clearly define critical thinking and develop a language around it—not just among teachers, but also among the students so that the whole school community begins to talk about, develop, and apply critical thinking across the curriculum. With this goal in mind, we identified 9 traits that are characteristic of skillful critical thinkers: Adapt, Examine, Create, Communicate, Collaborate, Reflect, Strive, Link, and Inquire. By modeling and teaching these 9 traits across the curriculum, educators can build a thinking culture that supports student growth and achievement. 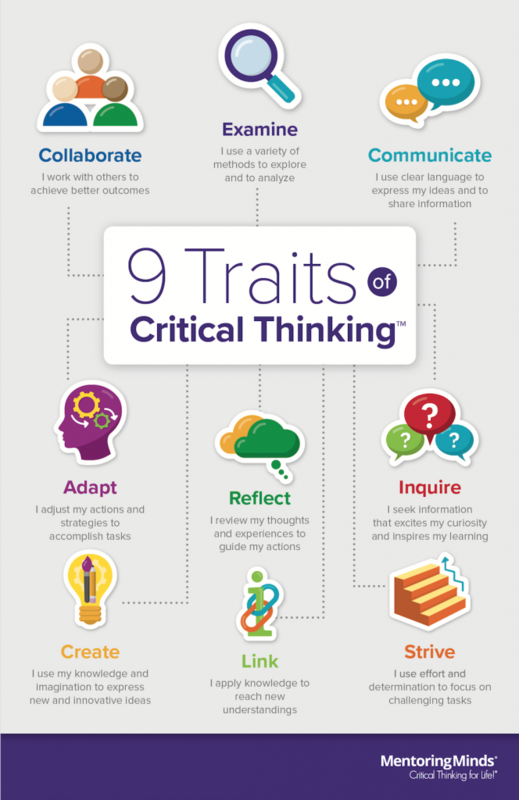 Download a 9 Traits of Critical Thinking poster for your classroom.